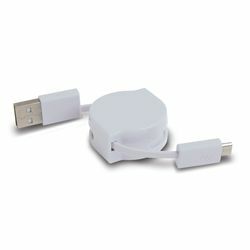 The retractable charge & sync Micro-USB cable offers an ideal way to store your cable when it's not in use. Just pull on both ends and the cable retracts into the housing. Take it with you anywhere you go! Made for: Android® phones & tablets Galaxy S® phones HTC® phones Digital cameras GPS units Wireless headsets e-book readers Android is a registered trademark of Google Inc. Galaxy S® is a registered trademark of Samsung Electronics Col. Ltd. HTC® is a registered trademark of HTC Corporation. The Android robot is reproduced of modified from work created and shared by Google and used according to terms described in the Creative Commons 3.0 Attribution License.